With the recent death of William Cuthbert, Maybole has lost it last Provost. 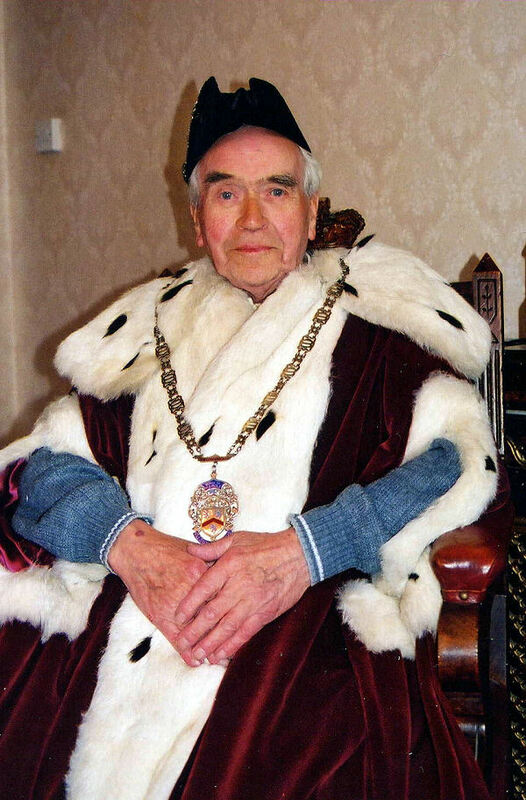 At his funeral at Masonhill Crematorium last week, Rev Tom McVicar described him as a man “who had a great love for Maybole and spent a great deal of his time working for the betterment of its people”. Bill Cuthbert was born in Drummellan Street on November 9, 1922; the third son of a family which through time consisted of five sons and one daughter. Subsequently, the family moved to Manse Street from where he attended Cairn Primary School and latterly Carrick Academy for his secondary education. After he left school, aged 14, he became an apprentice joiner with Frank Kennedy who had his workshop at Cassillis Road in the town at that time. Later he worked for Quentin Wilson, joiners, in Ayr. During that time he was involved in repairing some of the dreadful damage inflicted on the houses of Greenock by the German Luftwaffe. In 1942 Bill joined the RAF and did his basic training at Weston-Super-Mare. When stationed at Stourbridge in 1943 he met a young WAAF girl called Kaye who was to play a key role in the rest of his life! Soon after he met Kaye, he was posted to North Africa and then to Italy. Most of his time as ground crew was spent in the Naples/Sorrento region in that country. On February 14, 1946 he and Kaye were married during a short spell of leave from his duties in Italy. The honeymoon was short lived as he returned to Italy the following day! Shortly after his return, Mount Vesuvius erupted and he was involved in assisting the local population in the aftermath of that momentous event. After he left the RAF, Bill and Kaye came to live in Maybole in August 1946. Housing at that time was in short supply and they lived for a while with Bill’s parents. Jobs then were also hard to come by, so Bill took work where he could and was involved in the building of the “Cruden” houses in Whitefaulds Avenue and then through the auspices of “The Ministry of Works” he went to work in Gatehouse of Fleet for a spell in 1947. In 1951 Bill and Kaye moved in to a brand new house in Mochrum Avenue in Maybole and they lived there ever since. Bill had periods working with Tom McCreath and Russell Alexander, both joiners in the town, and later as a works manager with McCracken of Maidens. He joined Hay, Steele and McFarlane, a firm of architects, in the late sixties and worked there as a clerk of works for 16 years. His last three working years before his retirement in 1987 were spent as a clerk of works with Strathclyde Regional Council. Bill had a great interest in local politics and was a member of the Labour Party, joining Maybole Town Council during the 1960s. 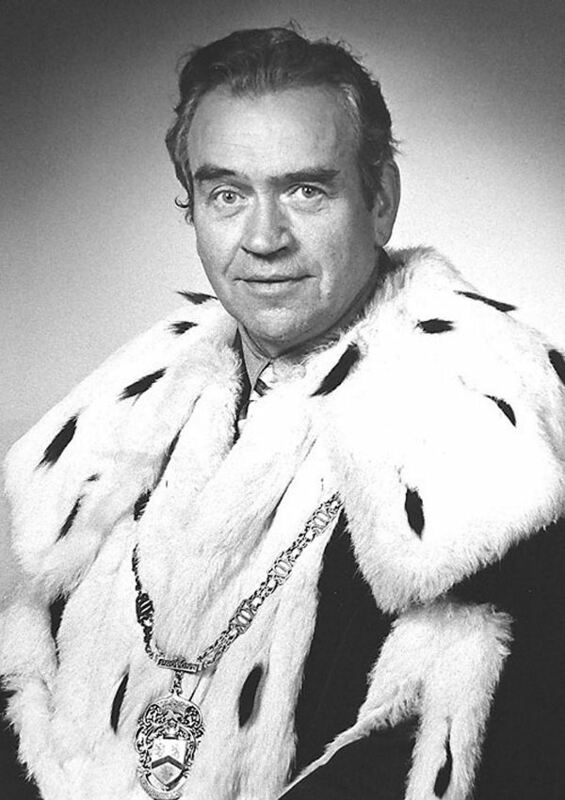 He served as Provost for two terms; 1969-72 and 1972-75 when regionalisation saw Maybole Town Council disappear to be replaced by Kyle and Carrick District Council and Strathclyde Regional Council. Bill was Maybole’s first councillor on the District Council serving from 1974-77. After a break, he won the seat again serving from 1980-84. 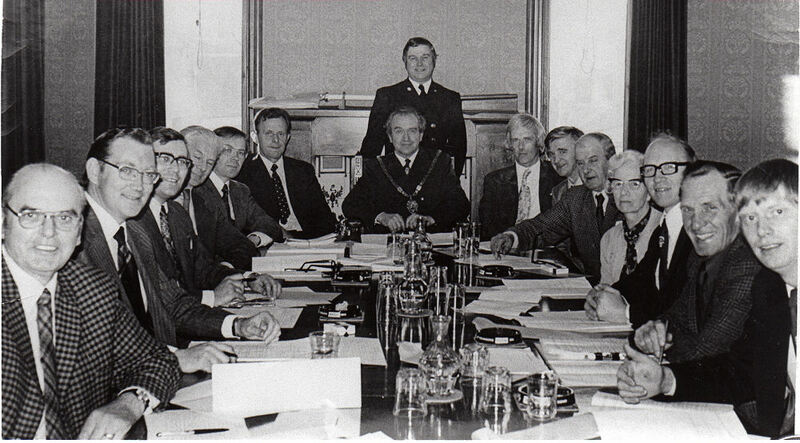 Bill was a board member of the Co-operative Society, a founder member of Carrick Speakers Club and was also involved with Maybole Community Council, the Cabin in the Town Hall and Carrick Housing Association in its early days. Bill was also instrumental in alterations at Glebe View along with his son Glen and Tom Corbett for facilities for the local amateur football team. Rev McVicar said, “Bill worked tirelessly for the town and many of the benefits we enjoy today are due to his vision and interest. These include the swimming pool, housing, traffic lights to name but a few.” During their married life Bill and Kaye enjoyed holidays abroad and in particular they visited Italy many times. Unknown to many, Bill was almost fluent in Italian which could be brought on by a couple of whiskies! They visited many parts of Europe and also had two holidays in Russia including a visit to Georgia. Their other main pastimes were a visit to the Speakers Club with their friends on a Saturday night, the bowls in the Town Hall and the welfare of the old folks of the town. Both Bill and Kaye were involved with the local OAP Association and both were chosen as Citizen of the Year - Kaye in 1994 and Bill in 1995. Bill was also the first person the community council presented with a special medallion embossed with the town's coat of arms. In his latter years, Bill had also developed an interest in researching his family history. “Recently,” said Rev McVicar, “he had a fall which led to a hip operation and complications which placed him in the Biggart Hospital for 10 weeks. The complications were to develop, which led to a time of suffering. “He found that difficult as he drove his own car till he was 85, going to Culzean, Maidens, Ballantrae and beyond. Concluding, the minister added, “We give thanks to God for one who sought to serve his fellow man above and beyond his own interests.” Bill is survived by his wife Kaye, his sons Ian, Glen and Brian, seven grandchildren and five great grandchildren.